Shutters are solid and rigid window treatments that are set within a structural framework and are composed of horizontal, flat vanes (fixed or movable), attached at the top, center and bottom of the framework. Most shutters are hinged on either side of the window opening, to swing inward for more flexibility in light and air management. 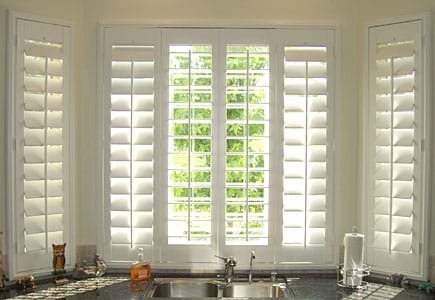 Shutters can be designed as a single unit to cover the window or can be customized into multiple sections to allow different areas of the window to be open or closed independently. 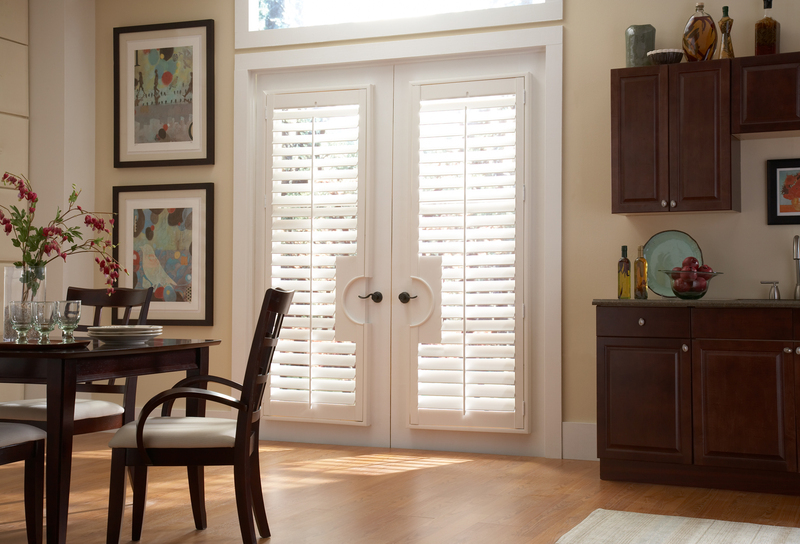 You can mount shutters as an inside mount or as an outside mount. Cafe shutters only cover the bottom part of the window area. 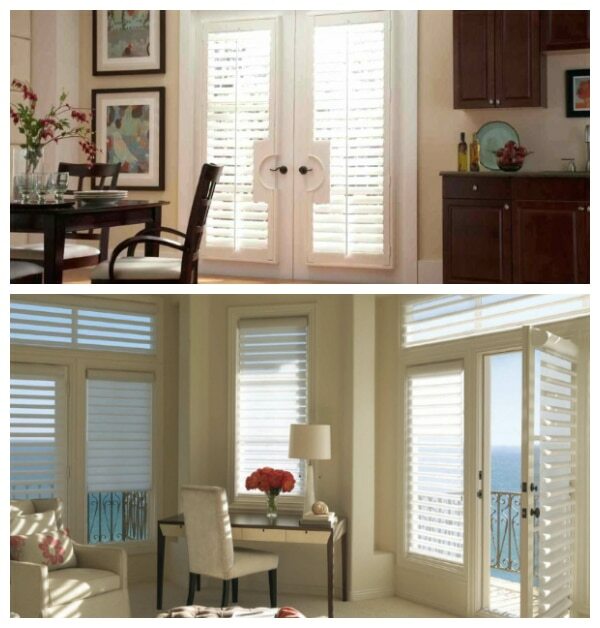 Full length shutters are available for doors and windows of all shapes and sizes – the possibilities are endless. 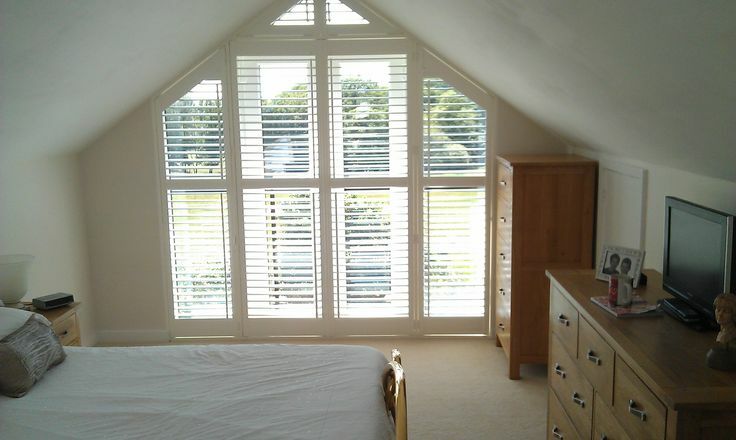 Shutters do provide ultimate privacy, flexible light control, security and add value and style to your home. 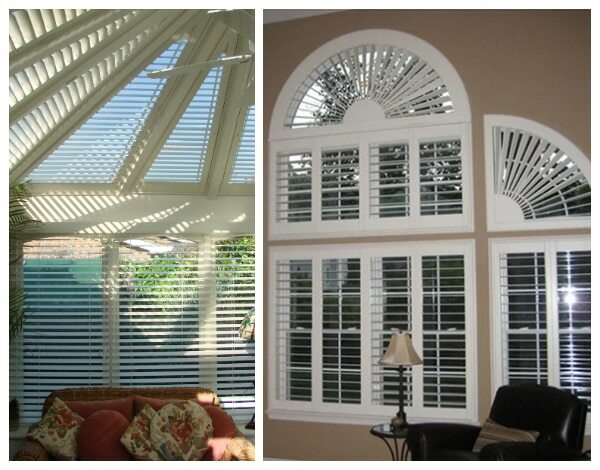 For many people, shutters are just the supreme choice for their windows. 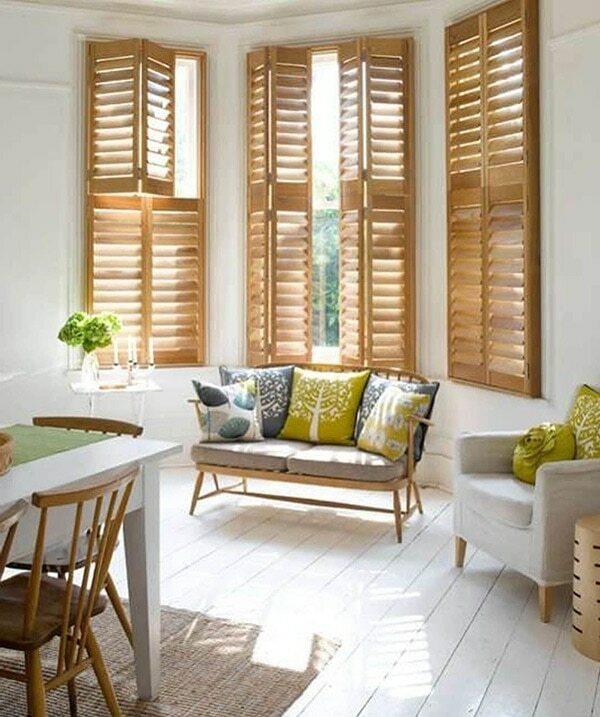 Shutters never go out of style and blend into every decorating theme. Originally, shutters were fashioned from wood as woodworkers in America honed this craft to an art, but now many new materials are available to create many choices for quality shutters. Wood shutters are still perceived as the winner of the blue ribbon. 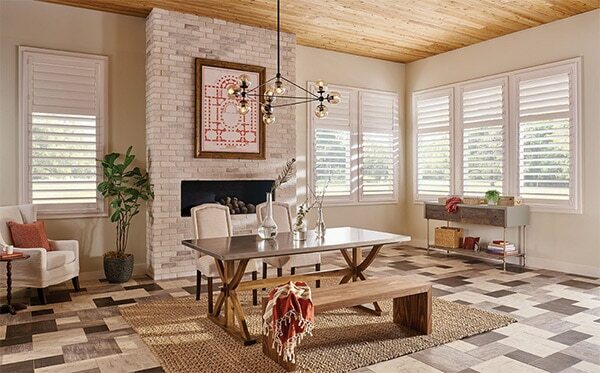 Wood shutters are the luxurious selection for the classic look and feel of the rich grain of wood and the durability and beautiful look of wood. Traditional white stains through the neutrals and dark wood glazes will complement the look you want to achieve. Wood does require more care as it tends to warp in high moisture areas and is easily chipped or scratched. If you love the true look of wood shutters and can’t imagine anything else but the lovely patina and the substantial look and feel of wood, this is the choice for you. Composite wood shutters give you the best of both worlds. A wood core provides strength on the inside as the vinyl covering gives you protection from harsh light, high humidity and abuse. The louvers are hollow, giving you a higher level of insulation. If you love the look of wood but want some added practicality to your shutters, select a composite wood for easier care and flexibility of use. 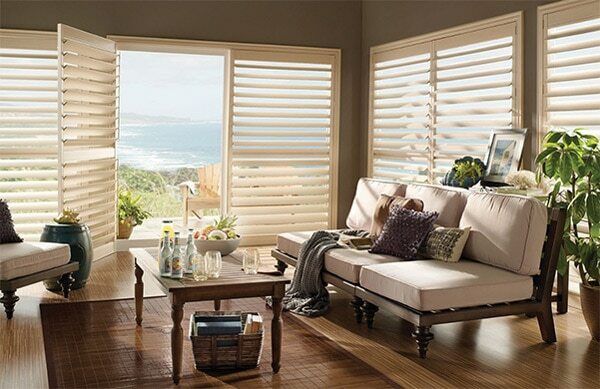 Vinyl Plantation Shutters are constructed of a strong synthetic poly-resin material, that give you the classic wood look but the reliability of vinyl shutters to resist the environmental effects that cause warping, fading, and scratching. 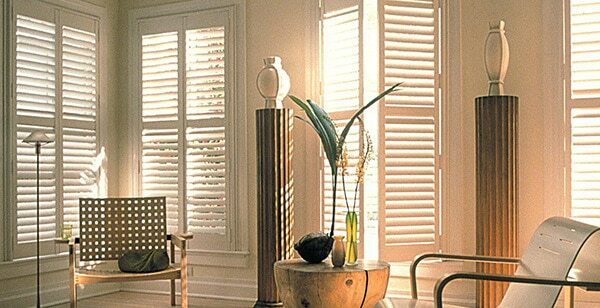 For all of our active areas and rooms such as kitchens, playrooms and bathrooms, vinyl Plantation Shutters should be considered as the low maintenance, long-lasting, sturdier window treatment. 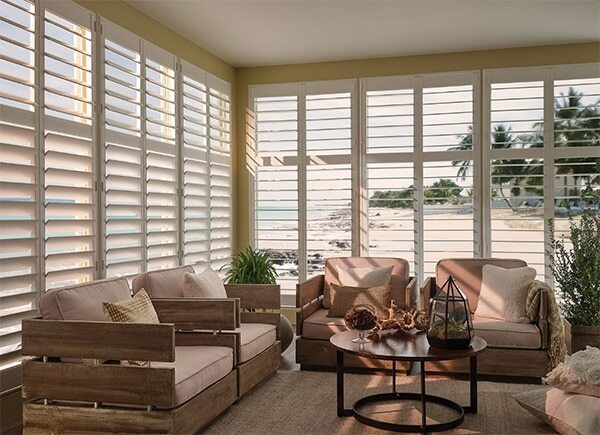 Since customized shutters are one of the most luxurious window treatments, here are a few ideas of how decorative and adaptable these shutters can be in windows that are challenging or just need a bit more design thought. 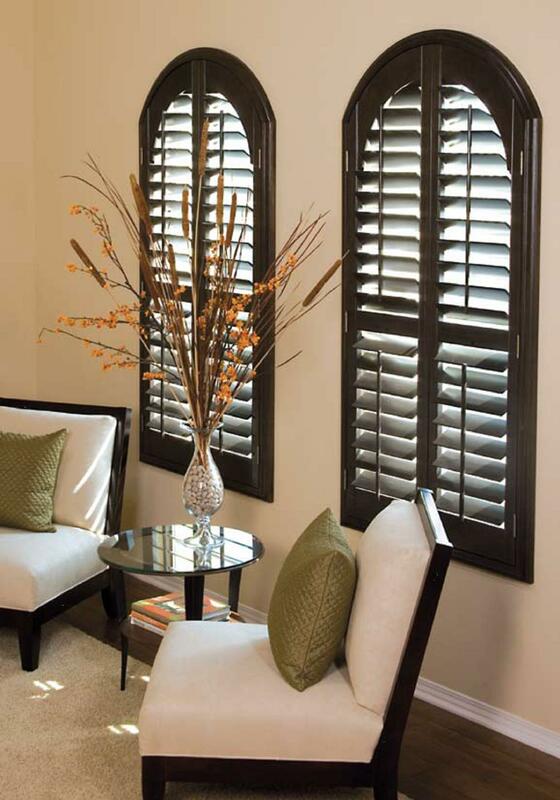 Shutters add structure and charm to your décor as they seamlessly blend into any interior design. Shutters are a great option on those beautiful French windows and doors. Just make sure that the shutters open the opposite way to the doors or windows. 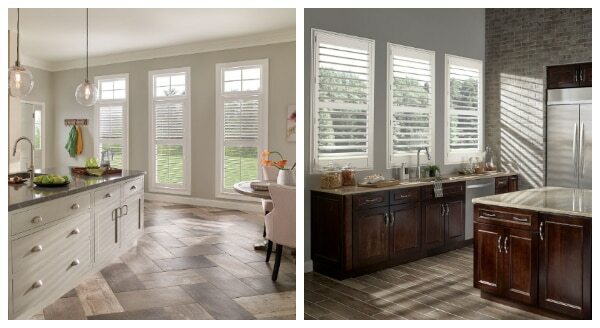 Multi-tier shutters give you “multi” choices. You can open and close or vary the levels of openness for each section of the shutter as the light or your mood change. Cafe shutters give you 1/2 light and 1/2 privacy as the shutter only covers the bottom 1/2 of the window. 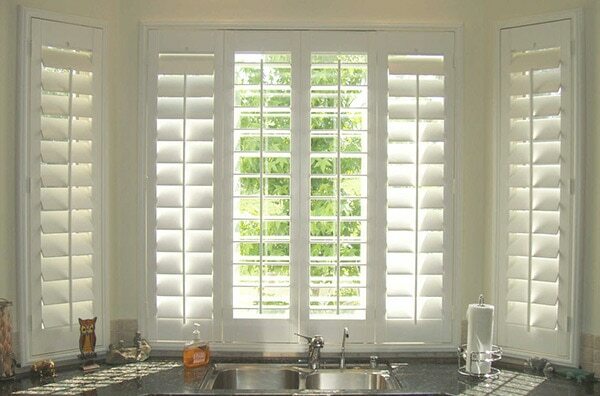 A bank of odd shaped windows demands the treatment of custom shutters as each window can be fitted individually to make an impressive statement. 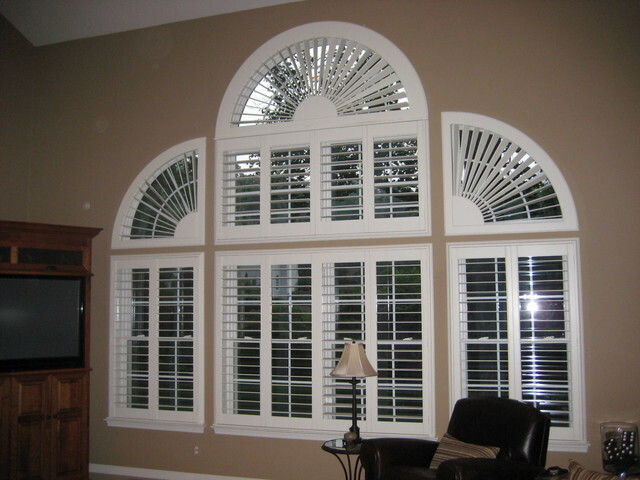 Arched windows look stunning decked out in shutters, accented above with a beautiful arch. 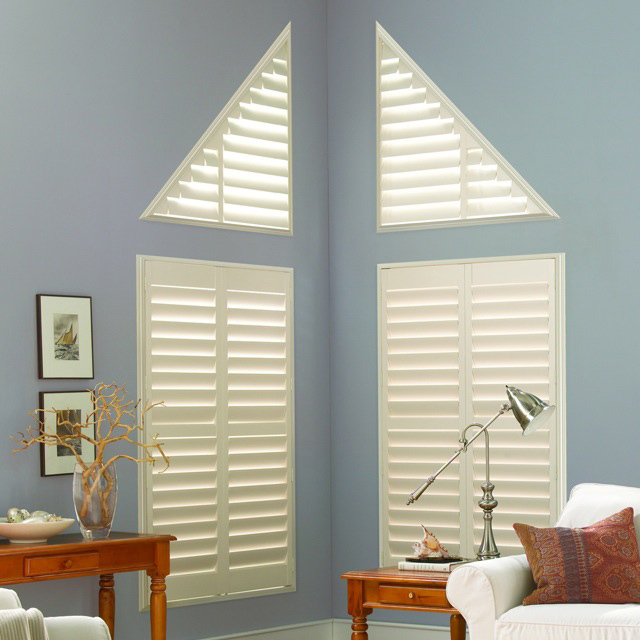 Angled windows and teeny windows are also perfectly suited for a shutter window treatment. Extra wide slats are becoming popular and make a modern bathroom shine. Shutters do take time and precision in ordering, as each window must be carefully considered for how it is positioned for depth and any other idiosyncrasies. With that in mind, I strongly advise a consultation with our window treatment experts to ensure that your measurements are correct and all the particulars have been checked and rechecked. Then, I know your new shutters will expand your view to new heights of design-a simply amazing window treatment! I really liked your post! My husband and I are thinking about redesigning the interior of our home, so I’m happy I came across your post! I hadn’t ever thought about installing shutters inside of our home, but I absolutely loved how they looked in your pictures! I especially liked how the plantations shutters looked. I think that shutters like those would be a perfect fit in our home! I’m going to show my husband these pictures to see what he thinks about having them installed during the renovation. Thank you for posting!